If you’re a motorcycle manufacturer, you’d better have a very good reason for not building an ADV bike these days. Riders flocking to adventure machines are valuable customers, and the segment continues to grow. While KTM, Triumph, BMW and others embrace the branded ADV riding style, Suzuki keeps offering the same V-Strom line. Things weren't always this way for the Big S. At one time, Suzuki had a cutting-edge adventure brawler to compete at the highest levels. Rumors of its return in 2020 have me wondering: Suzuki, will you build us a killer adventure bike? The DR Big made a name for itself with rally legend Gaston Rahier. Suzuki photo. What did Suzuki offer back in the day? Back before the modern ADV craze, Suzuki and other manufacturers still offered a range of dual-purpose motorcycles, all the way up to Paris-Dakar replicas. A major difference between those motorcycles and today’s is power. ADV bikes with triple-digit horsepower as we know them today just didn’t exist then. So how large did they get? Suzuki offered a monster: the DR Big, also called the Desert Express. (I’m struggling to think of a motorcycle with better names than those!) The DR Big came out in 1987 with a colossal 727 cc thumper, later upped to an 800. It faced contemporaries like the Yamaha Ténéré and the Cagiva Elefant (another great name) on the sands of Dakar as well as the showroom floor. The DR Big is credited with introducing the plague-mask beak style to motorcycles. You’ll find similar front ends on most ADV bikes today. Overall, the DR Big was impressively ahead of its time. The V-Strom 1000 Adventure is Suzuki's ADV flagship. Suzuki photo. What does Suzuki offer now? If you want an adventure bike from Suzuki, their top-of-the-line option these days is the V-Strom 1000XT Adventure ($14,599), which is essentially a 1000XT ($13,299) with extra factory options installed. 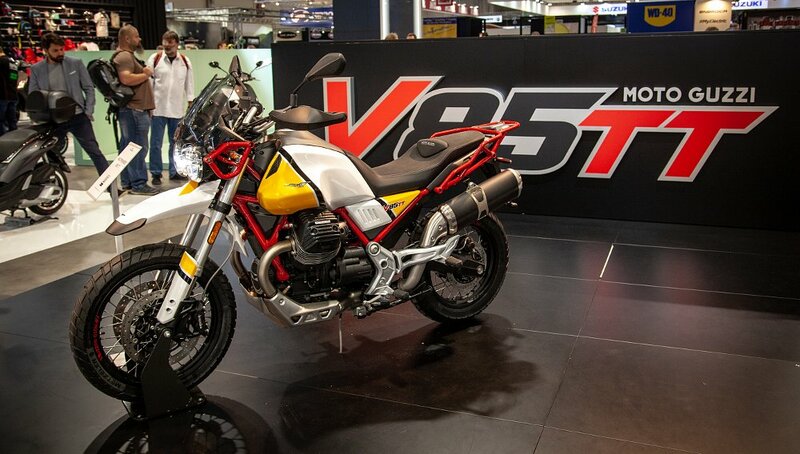 A smaller V-Strom 650XT, also nicknamed the “Wee Strom” ($9,299), is also available. If you’re OK with cast wheels instead of spokes, there’s the base V-Strom 1000 ($12,999) or the V-Strom 650 ($8,799). Below that, dual-sports like the DR650 or the DR-Z line put the focus deeper into the dirt. Consider all of these options, then look at the market. There’s a hole in the lineup between the big adventure-touring bikes and the smaller dual-sports. How about a lighter, taller, more aggressive modern ADV bike with the bang-for-buck to take on KTM’s adventurers, BMW’s GS line, and Triumph’s Tigers? Maintain Suzuki’s cutthroat pricing, and that’s a winner. The DR Big shown presumably inspired Oberdan Bezzi's concept rendering in this article's main photo. Suzuki photo. 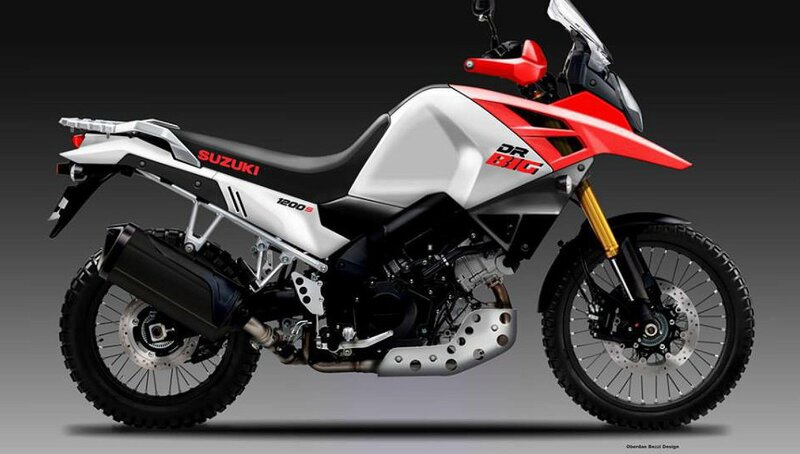 From what we know so far, the unconfirmed but very possible DR Big sequel would probably use the V-Strom 1000 XT’s engine, frame, and some other running gear. Spoked wheels are the only option here. A 21-inch front would put it more in line with serious contenders like the big KTMs. If they can improve on the Strom’s ground clearance, all the better. I expect Suzuki to own the beak and reference the original Desert Express with the new design. Simple, sturdy, and effective bodywork is all the ADV crowd wants anyway. This whole story reminds me of what Suzuki did with the Katana reboot. That bike took a legendary model line, dropped it on an existing platform, and created a new product. Similarly tweaking and tuning the V-Strom 1000 XT into a more capable off-road package at a price well under even the small BMW bikes would absolutely get the attention of the ADV community. A dash of retro looks wouldn’t hurt either. Moto Guzzi took a similar approach with the throwback styling of their new V85TT ($11,990), and that motorcycle has received plenty of positive feedback. So Suzuki, here’s the move. Strip a V-Strom, build it to slay the trails and munch road miles, then channel the DR Big with styling cues and big torque. Keep this motorcycle to just the essentials with the ability to add more to suit your riding needs. Price it aggressively. (Engine and frame tooling was paid for long ago!) Make it look good, sell tons of them, and build the bike’s reputation as an affordable, capable adventure rig. If it sells well, maybe build a “DR Wee” on the 650 platform to reach that market. The opportunity’s there. Will Suzuki take it?